The MCC provides an exquisite tool for the Mission Command to plan, follow, analyse and archive the missions of all flying units. In the MCC the mission is prepared before flight and followed and managed from the ground in real time during the flight. The MCC displays the flight track of all flying units on the tactical map. It receives data from the aircraft including position updates, incident reports, AIS and target information, images and streaming video. The incoming data is shown on a digital map in the MCC to give an overview of the situation. From the MCC further instructions can be issued to the aircraft in real time on how to proceed with the mission. All mission information is stored in a database from where it can be analysed and processed. 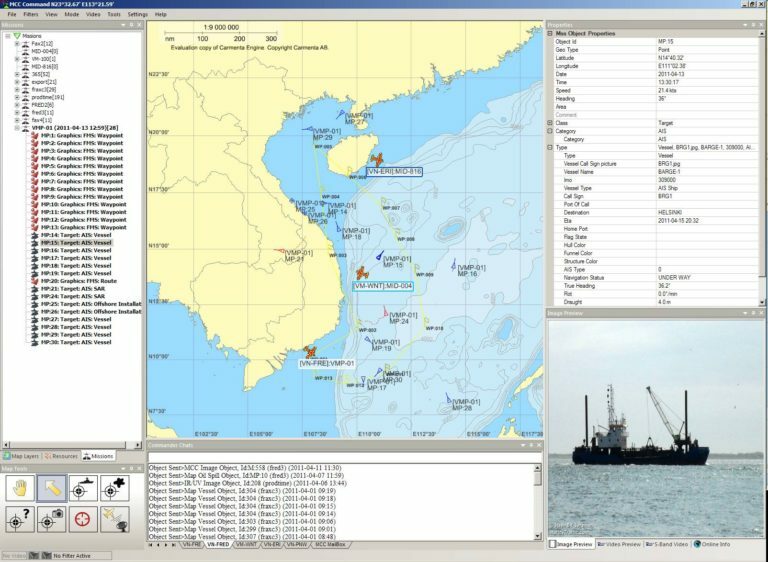 Using the built-in filter functions and background databases, important information about ship movements and the identity and activity of observed vessels can be easily visualised on the screen.